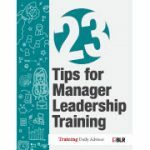 Download this free report for leadership training tips on a range of topics. From avoiding lawsuits, to mentoring, to proactive management techniques, this report is a must-read. Webcasts for Credit: Earn HRCI and SHRM recertification credit hours by joining us for a free live or on-demand event. Get your questions answered by expert speakers. HR Surveys & Research: See how your peers are solving tough workplace issues and planning for the future. Add to the conversation and share your solutions. Expert Insight: Read articles from industry-leading editors on the past, present, and future of learning. Week in Review: Get a weekly recap of the most popular learning news and free resources.